اکثر هکر ها هیچوقت دنبال کارهای سخت و پایین آوردن سرور نمیروند و در عوض با اسکن کردن سایت شما و پیدا کردن افزونه هایی که استفاده میکنید و نسخه جوملای شما دنبال باگ های نهفته کامپوننت ها و افزونه های شما می گردند. اما با نصب jomDefender اینکار برای هکرها بسیار سخت می شود چرا که این افزونه تا جای ممکن جوملای شما، نسخه جوملا و افزونه های شما را مخفی می کند. یک سیستم پسورد گذاری جدید برای جوملای شما تعریف می کند که عملا هک مدیریت را غیر ممکن می کند و نام جوملا را از سایت شما و هدرها حذف می کند. از دیگر کارهای این افزونه می توان به حذف فضاهای خالی بین سورس صفحات html اشاره کرد. این امر باعث می شود هکر ها برای اسکن صفحات شما به مشکل برخورد کنند و این اولین ضربه نا امید کننده را به هکرها وارد می کند و یکی از جالبترین امکانات این افزونه جلوگیری از دستورات مشاهده موقعیت های قالب سایت ‘?tp=1’ می باشد که در مجموع با تمامی این کارها امنیت سایتتان به شدت تضمین می شود. همچنین این افزونه قابلیت استفاده همزمان در کنار کامپوننت Rsfirewall را نیز دارد. به گفته سایت سازنده : کسی که از jomDefender استفاده نمیکند مثل فردی است که موقع ترک کردن ماشین خود درهای آن را باز میگذارد! Each day, Joomla websites all over the world come under attack from ruthless hackers who deface front pages, delete critical data, upload malicious viruses, and steal sensitive customer information. Sadly, most hacker attacks cost owners dozens of hours and often thousands of dollars to repair. jomDefender is a must-have plugin to help you avoid costly downtime and embarrassing hacker attacks. Casual hackers don’t want to work too hard to gain entry to a site or server. They simply scan websites, looking for known identifiers that tell them whether a site is running a software they're particularly skilled at breaking and entering. Unfortunately, Joomla is often targeted by hackers, due to its popularity, and also due to many site owners who do not properly protect themselves from intrusion. Running a site without jomDefender is like leaving your car running, with the doors wide open, in a crowded parking lot, in the bad part of town. Every single day. You're inviting trouble, and sooner or later, that trouble will find you, and take you for a ride you'll never forget. Once hackers can identify the software, they will run pre-fabbed hacker scripts to help them gain control of your site, and the rest is history. All your content, data and customer information could then be wide open for the hacker to take, and often sell to others too. 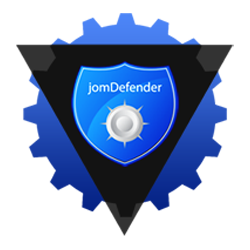 jomDefender keeps your Joomla applications hidden and protected, to prevent attacks from casual hackers, by scrubbing known Joomla identifiers from your site. Additionally, jomDefender also protects your site with security features such as an extra admin login screen (makes hackers guess two unique admin passwords instead of one), front end & backend IP ban/blocking, and much more. We've even added a bonus feature in jomDefender that lets you find the best configuration for your website to optimize its page-load time.